No jokes. Just watch Up. No one company has given me as much movie enjoyment over the last 14 years. No actor, director or studio has me anxiously awaiting even the announcement of the next project as Pixar. Why Pixar over say Dreamworks or really any other animation studio? Pixar value story over pop culture references and winking at the screen, genuine charm and consistency over simple cuteness and syrup, and establishing character over crass marketing ploys (probably “Cars” aside). After today I can say with absolute confidence that it will be 10 before the end of 2009, or at least as soon as they release Up. Up is awesome. I’ll need to watch it again to mark it exactly, but it is at minimum a 9 / 10 and perhaps a 9.5. Only a few minor quibbles will ultimately decide the last 0.5. If you are like me and already know how brilliant, and more importantly consistent Pixar are, you need read no further, there is no letdown here. Go line up to watch Up. 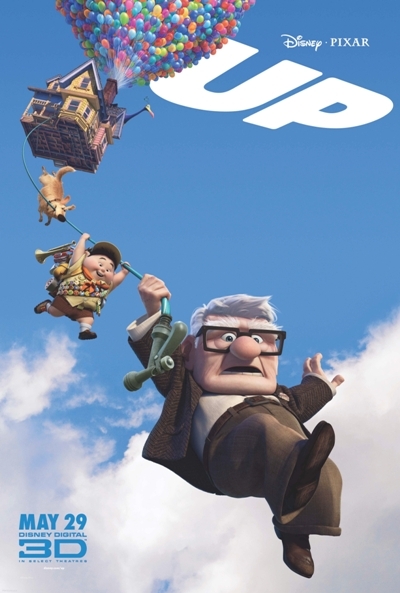 It doesn’t even matter if you have kids or not, Up is just a great movie. I for one have watched every Pixar release since Toy Story in 95, which was of course the first, and as my son is still too young to go to a cinema I went to Up kid-free. Don’t be snobbish adults, you’ll miss out on some great flicks. If you are still uncertain… here is what Up is about. We open with a star struck little kid, maybe 7? at the “moving pictures” in what might be the 40s or 50s, watching a news piece on the rise to prominence, and subsequent fall from grace of explorer Charles Muntz. On the way home, still on a giddy high from his 40s fanboy experience, the boy runs into a similarly aged young girl, also an explorer enthusiast named Ellie. In the ensuing days the boy, named Carl and Ellie play explorers and grow into good friends, even hatching a plot to move to Paradise Falls, the South American place discovered by the aforementioned Charles Muntz. Carl and Eddie are polar opposites, Carl seems quiet, shy and introverted, Ellie is loud, opinionated and outgoing. Now comes the most moving dialogue-free few minutes that I have experienced in a film for perhaps ever. A simple slowly paced montage shows that Carl and Ellie ultimately marry, and how they grow together through life. Realistically this is the kind of step that can only be pulled off by an animated movie, but this few minutes is amazingly effective. In it we learn more than we could have discovered in a totally separate 90 minute film about the same characters. One key point from the montage is that despite their best efforts, Carl and Ellie are never able to save enough for their trip before the funds are needed elsewhere, and that ultimately Carl is left alone. No sappy last words, no clumsy togetherness, just a lifetime summarized in minutes. 10 minutes in, and I’m genuinely sad. Carl is now 70 something, think Clint Eastwood in “Gran Torino” without the forced everyone is racist – but that’s sometimes OK clumsiness. (I haven’t got time to go into it now.) He lives in the same home that he and Ellie shared, and now it more than anything is the embodiment of his deceased wife and their happy life together. Therefore, while progress is altering all around him he stubbornly refuses to move with the times. One day a knock at the door introduces us to Russell, a Wilderness Explorer (Boy Scout). Russell is looking at adding to his hefty collection of merit badges by helping the elderly. A momentary digression, Up is a movie with no momentary character lapses or abrupt about-faces. There are no rapping grandpas or super intelligent kids. Russell is a typical 10 year old kid through the film, well meaning, book smart about topics a 10 year old should be (animals and such), especially Wilderness Explorers but unaware of how much of real life actually is. He says 10 year old dumb things because he doesn’t yet know any better, Russell is a typical 10 year old boy growing up. Carl is a crotchety old man, and remains a crotchety old man over the duration of the film, when he does change it is only subtle and for legitimate reasons. Back to the film, Carl shoos Russell off with a wild goose (snipe?) chase, and goes back to his lonely existence. After a run in with developers, Carl is told that he has run out of time and must move to a retirement home, and two men show at his door to take him there. Now anyone who has seen the preview and perhaps the poster knows what happens next, so there should be no surprise at how he leaves, but when it dies happen it was a spectacular event, both visually and cinematically, and it carried a real sense of something actually happening, not just a plot device. I had all over tingles for minutes. Good ones. Again the trailer gives away the fact that Russell has come back to visit and has inadvertently stowed away with Carl on his journey to fulfill Ellie’s wish and Carl’s promise. Russell appears Asian-American (to be PC), and it is refreshing to see Asian-American animated actors getting more work, as up until now the animated landscape has been dominated by white, black, green and blue characters. I can’t go into too much more detail as the plot expands and evolves from this point, being animated it can do that without veering too far into “Come off it!” territory. Carl and Russell (well really Russell) befriend an 8 foot tall South American bird while “walking the house” the final stretch to Paradise Falls and the bird, who Russell names Kevin becomes quite protective of him. Yep I said Walking the House. I’ll go spoiler free from here, Up is a film that earns the right to unravel in front of the audience. Once in Paradise Falls they meet more characters, not all human, but equally capable of communicating. I think that in 2009 “SQUIRREL” will become one of the more frequently quoted lines. There is a very effective chase scene, house included, and a finale that makes Carl the most geriatric Indiana Jones type character since, well Harrison Ford in Indiana Jones and the Kingdom of the Crystal Skull. Being an animated film involving a man floating his house to another continent and his subsequent adventures of course the plot includes ludicrous events and situations, yet the only one that felt out of place occurs in the final sequence, and I really think that they could do away with it without taking away from the finished film. I reckon it would improve it actually, but even with that minor blemish (make up your own mind when you see them) Up is amazingly entertaining, and deserves repeated viewings. Once I have watched it again down the track I will revisit my Final Rating, but Up earns every digit. It seems redundant to add but the animation is amazing as always, I’m sure that the standard will improve over the coming years but I see no problem with where things are now. One final point, like “The Incredibles” and even “Finding Nemo” there are a few situations where Carl and Russell and various animals are put in danger, so younger children may be a bit distressed at times (OK parent hat off). Final Rating – 9 / 10. There is nothing more certain than the fact that I will be watching this many times in years to come. This is already Top 5 all time within animated movies in my view. Time will tell where exactly it settles.